Sanyo has introduced four new models in its PLC line of ultraportable LCD projectors. Two of the new models offer wireless projection capability via USB. The PLC-XU355 and PLC-XU305 offer a new feature Sanyo calls "Simple Wireless Setting." Using a supplied USB memory drive, a wireless (802.11b/g) connection can be established between the projectors and a Mac OS X- or Windows-based computer for projecting up to 98 feet from the computer. With this feature, up to five projectors can be connected to a single computer, and individual projectors can be connected to multiple computers. Sanyo said the feature can be activated with a single click (in most cases). 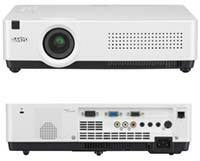 Sanyo has also introduced two projectors in the lineup without this wireless connectivity, the PLC-XU350 and PLC-XU300. Instant powerup and shutdown (no button required). The PLC-XU355 and PLC-XU305 also include a 1.6x optical zoom lens and a DVI-I input. All of the projectors offer RGB input (two inputs on the PLC-XU350 and PLC-XU300), S-video, composite, stereo RCA jacks, and a stereo minijack. The wireless PLC-XU355 and PLC-XU305 each weigh 6.4 pounds. The PLC-XU350 and PLC-XU300 weigh in at 5.7 pounds. All of them measure 12.8" x 3.27" x 9.1". All of the new models are expected to be available in mid-May. The PLC-XU355	will sell for $2,595; the PLC-XU305 will	be available for $2,395; the PLC-XU350	will sell for $1,495; and the PLC-XU300	will sell for $1,295. Further information can be found here.